Vaulted ceilings are known for their wide range of utility. They look sophisticated indeed, and add to the architectural value of your house. When you opt for a skylight in the vaulted ceilings, the room turns bright and airy. You can use vaulted ceilings in a number of areas, and a Vaulted Ceiling bathroom can be made unique with the right design incorporation. 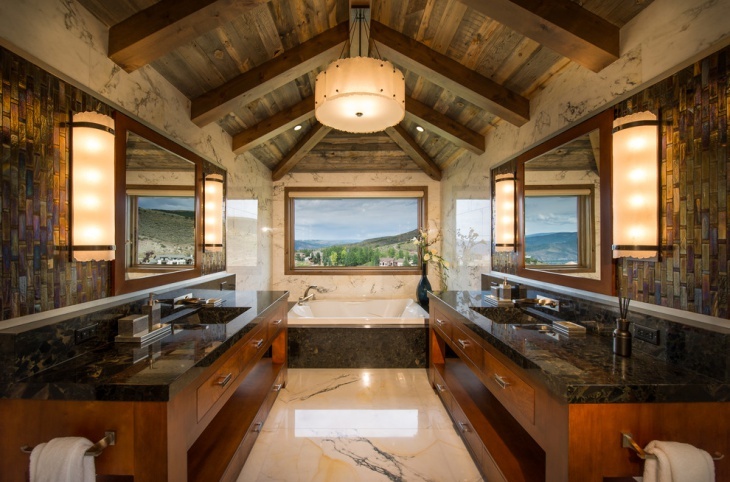 Here you will find ten classy bathroom designs with vaulted ceilings and you can incorporate any one of these in your mansion. 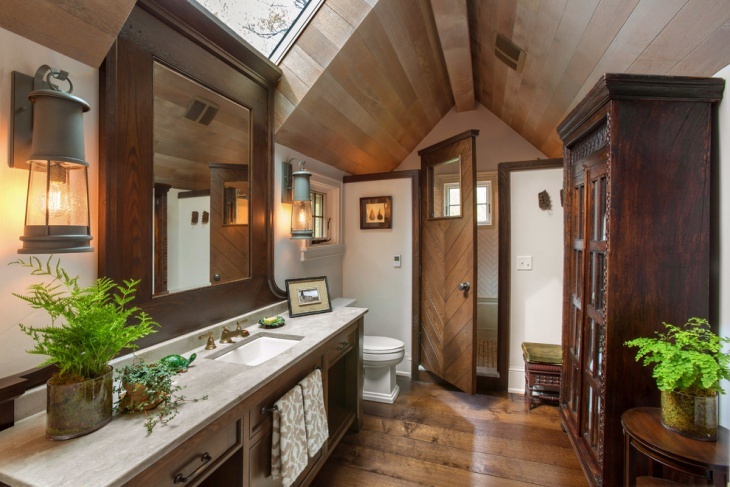 When you crave for a rustic look in a traditional bathroom, you can opt for a sloping vaulted ceiling made of weathered wood. It has a great compatibility with the black marble countertops and large wall mirrors. A fibre optic pool lighting makes a perfect match in this bathroom setting. 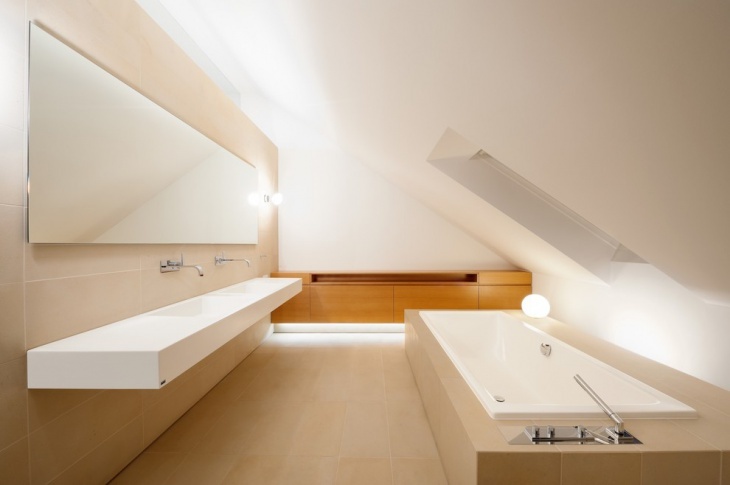 When you have a long and narrow bathroom with mirrors along the side, a tray ceiling serves the purpose best. With soft blue interior in the house, you can opt for small pendant lights along the sides. 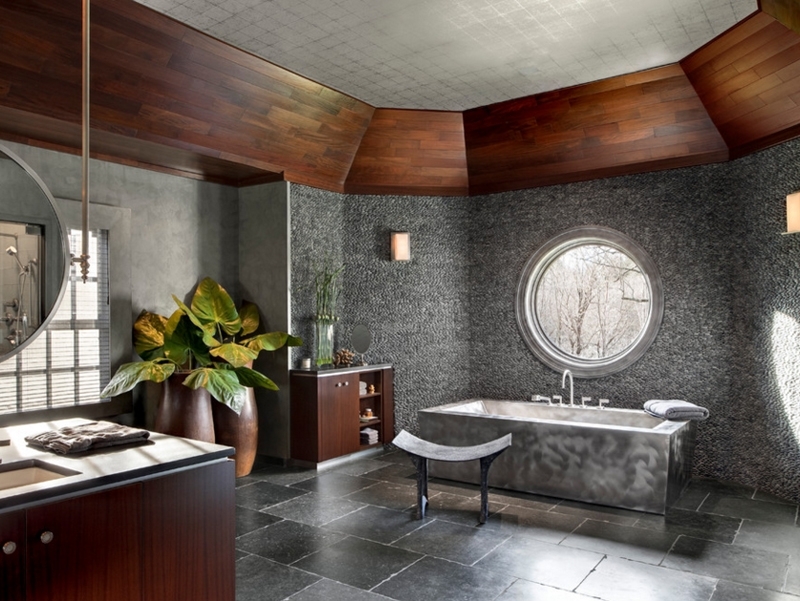 Get some sophisticated bathroom accessories and round-vessel sinks to yield the complete look in the bathroom. A dark brown and grey colour combination goes well with spacious bathrooms. You can pick a preferred geometric design for the ceiling. The steel-grey colour of the ceiling needs a good match, so make sure that you use the same colour for the tiled floor and textured wall. The round window panels are perfect for this setting. This is an innovative way to craft the ceiling, with a sloping edge. Modern bathrooms are experimental in looks, and people having a fascination for the white colour can use polished white tiles for the lower half of the wall. The upper half is painted in spotless white. The small white square tiles for the floor has a contrasting black margin. 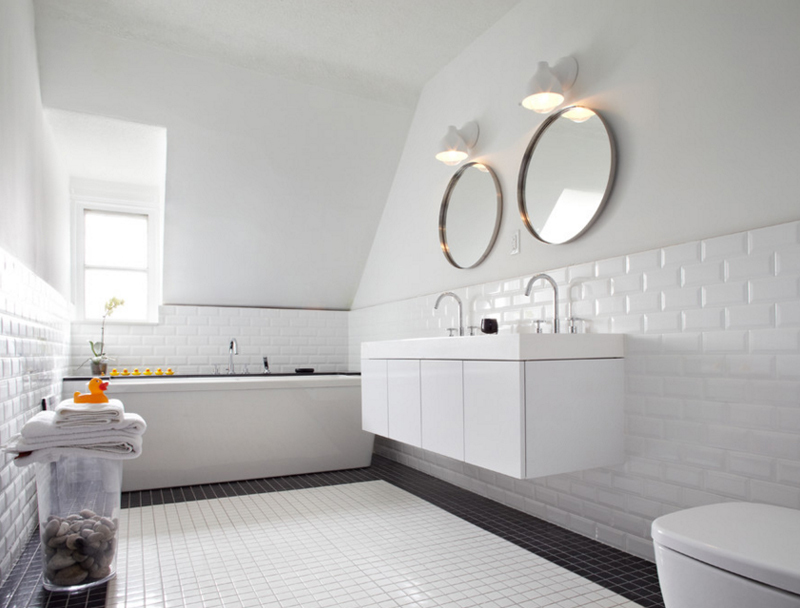 In contemporary times, people prefer large and spacious bathrooms with elegant white walls. This particular design looks outstanding with a sloping vaulted ceiling. The white ceiling goes well with the bright accessories and high window in the room. A black and white combination is ideal for a tropical bathroom, and you can get in touch with a slanted ceiling design. You need to have a compatible look in the interior, with matching walls and floors. The square tiles used in these areas are black. 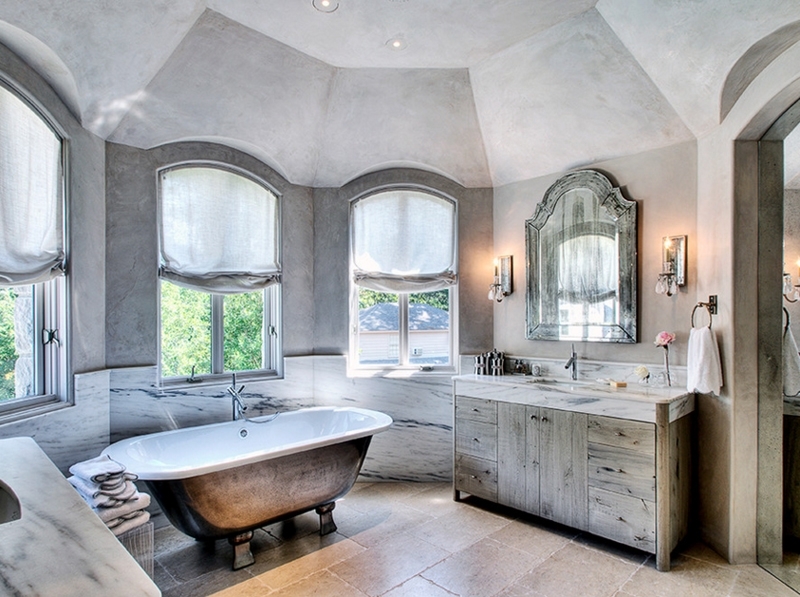 The white bathtub and sink ensure that you strike the right contrast. You may be a lover of vintage housing styles, and in this particular bathroom, you will find the right taste. The sloping vaulted ceiling has a bright wooden color, and you need to have a mirrored wall in front of the cabinets. Opt for a white countertop to get the touch of elegance. 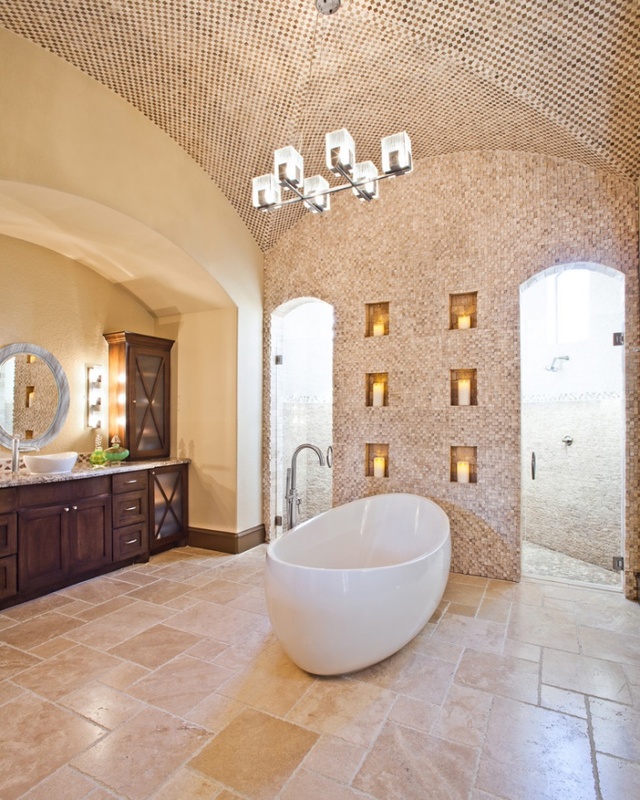 When you have a large and spacious bathroom, go for the Mediterranean style when you choose the ceiling. The polygonal upper walls and ceiling has a sophisticated look, and the slate-grey colour is ideal for the walls as well. a vintage mirror and rustic accessories yield the best look from the bathroom. 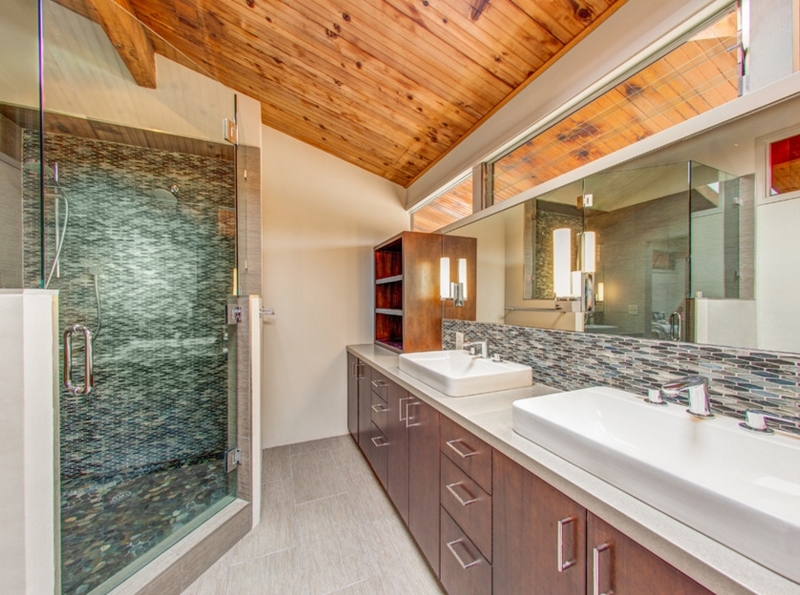 A perfect blend of wood, tiles and glass make a striking contrast in this bathroom. There are thick wooden beams supporting the vaulted ceiling. The window frames have the same raw wood finish, and this goes well with the glass door and windows. A marble finish in the floor looks great with this setting. The best way to derive the intrinsic beauty of vaulted ceiling is to choose the right design and type of ceiling. 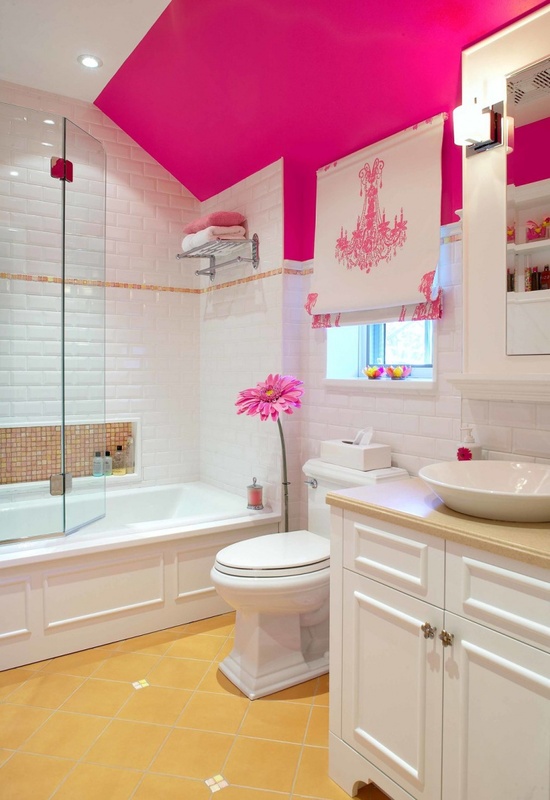 There are various contrasting color combinations that you can opt for in a bathroom. A Vaulted Ceiling bathroom can be blended with small bathroom ideas and you can come up with new ideas when you craft your bathroom ceiling. Well, if you have anything new in mind, you can share it with us.